How do I connect the Razer Nari Ultimate headset to my PC? My Razer Nari’s mic is not working following an update to Windows 10 build 1809 and above. Select your Razer Nari headset within the dashboard. Navigate to the Mic tab. Ensure that the Ambient Noise Reduction box is checked. Next, navigate to the “Sounds” Settings in Windows. Right click on the speaker icon in the bottom right of your task bar and click on “Sounds". Select the “Recording Tab” and make sure the Razer Nari is selected as your default device. Next, click the “Properties” icon located at the bottom of the pop up. Navigate to the “Advanced” tab. Change the Default Format to "1channel,16bits,44100Hz". If further support is needed please contact the Razer Support Team here. Can I chat with my friends on Nintendo Switch using the Nari Ultimate? Unplug the provided 3.5mm cable from the headset if it’s connected. Plug the 3.5mm cable into the Nintendo Switch’s audio jack without connecting to the Nari headset. Plug the 3.5mm cable into the Nari headset. Can I use the Nari Ultimate with my Xbox One? The Razer Nari Ultimate can be used with your Xbox One using the 3.5mm cable. To connect your headset to the Xbox One using the 3.5mm port, please visit the official Xbox support page. Note: The wireless operation of the Nari ultimate is not possible on the Xbox One. For a wireless Xbox One connection, check out the Razer Thresher for Xbox One. How do I clean my Razer Nari Ultimate headset? When cleaning the earpads on your headset, take extra care not to get any liquids inside the earcup and onto the speaker itself, as this may damage your headset. I plugged in my Razer Nari Ultimate headset and I can't hear surround sound, what should I do? Please be sure to install Razer Synapse 3 and ensure you are signed in. Also ensure that "Razer Nari Ultimate" is selected as your default sound device in your computer's Audio Control Panel. How do I enable or disable the THX Spatial Audio on my Razer Nari Ultimate headset? You can use Razer Synapse 3 to turn THX Spatial Audio on or off. How does the THX Spatial Audio work on my Razer Nari Ultimate headset? THX Spatial goes beyond traditional virtual sound. With integrated content, THX Spatial Audio breaks the boundaries of defined 5.1 and 7.1 channel surround to deliver seamless 360° positional audio for more natural and lifelike positioning. It also adds depth to the experience by simulating both sound above and beneath you. What is the difference between THX Spatial Audio on the Razer Nari Ultimate and the immersive 7.1 channel virtual surround sound paired with the Razer ManO'War and the True 7.1 Surround Sound Gaming with Razer Tiamat 7.1 v2? The 7.1 channel Virtual Surround sound utilized on the Razer ManO'War uses a more traditional technology that Razer uses to simulate 7 channels with only 2 physical speakers (1 driver on each ear cup). With True 7.1 Surround there are 5 drivers on each ear cup, the same as a home theatre system with physical surround speakers. 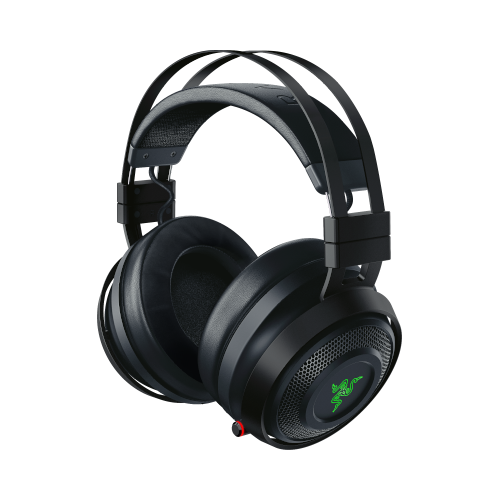 Is my Razer Nari Ultimate headset supported in Razer Synapse? What are the features supported in Razer Synapse? Yes, the Razer Nari Ultimate is supported in Razer Synapse 3. The following features are supported in Synapse 3: Mixer, Enhancement, EQ, Mic, Lighting and Power. Where can I find the USB dongle for my Razer Nari Ultimate headset? The USB dongle for the Razer Nari Ultimate can be found in its convenient storage location, in the headset. Please see the image below for exact location. Why is the Razer Nari Ultimate microphone not transmitting my voice? Please ensure that the microphone is not muted in your operating system and that the Razer Nari Ultimate is selected as the default recording device in the Audio Control Panel or in the Software Microphone Options. Why is the Razer Nari Ultimate not producing sound? Please ensure the Razer Nari Ultimate is not muted in your operating system and that the headset is set to be the default playback device in the Audio Control panel or in the Software Audio Options. What Synapse 3 Chroma lighting effects are supported by the Razer Nari Ultimate? Quick and Advanced Effects are supported in Synapse 3 with the Razer Nari Ultimate. Quick Effects include Breathing, Spectrum Cycling and Static. Why am I hearing myself speak on the Razer Nari headset? Can I turn it off? Mic monitor is a built-in feature that allows you to hear your own voice via a feedback loop, designed specifically to help gamers avoid repeating themselves or shouting unnecessarily into the mic for fear that their teammates won't be able to hear them. You are able to configure the volume of the mic monitor in Razer Synapse 3. The default setting for the mic monitor on the Razer Nari Ultimate is set to OFF. How do I enable or disable the HyperSense on my Razer Nari Ultimate headset? You can turn on/off HyperSense within Razer Synapse 3. I lost / damaged my USB wireless transceiver for my Razer Nari Ultimate, can I purchase a new one? No, we are sorry, the USB transceiver for the Nari Ultimate is uniquely paired and you are not able to purchase a replacement transceiver. Is the Razer Nari Ultimate compatible with MAC? Yes, it will work via the USB dongle or with the 3.5mm Audio jack. However, users will not be able to configure the headset using Synapse 3 as it is not available for Mac. Where can I purchase replacement earcups for my Razer Nari Ultimate? You will be able to purchase replacement ear cups for the Razer Nari Ultimate from the Razer accessories store, https://www.razer.com/store/gaming-accessories. Is my Razer Nari Ultimate still capable of THX Spatial audio while being plugged in via the 3.5mm Combo jack? No, THX Spatial for the Nari Ultimate is only available when using the USB dongle connection. Can I use the Razer Nari Ultimate wirelessly without installing Razer Synapse? Yes , Synapse 3 is not a requirement to use the Nari Ultimate wirelessly. However, you will lose the ability to further configure the headset without Synapse 3. My voice is not heard when making a call using my Razer Nari Ultimate. Please try the steps below to help solve your issue. Launch Razer Synapse and select your headset from the dashboard. Navigate to the MIC tab and adjust the Mic Volume slider to 100. Ensure the Mic Sensitivity option “Automatically determine mic input sensitivity” is turned ON.